It's Time to Buy Philip Morris Stock. Here's Why. This "international growth" story has turned around, and now looks mighty fine. The commonly accepted wisdom in the cigarette industry goes something like this: Smoking is in decline in the U.S. Therefore, if you want to make money on tobacco, you must look abroad. You must buy Philip Morris International (NYSE:PM) stock. And as it turns out, in this particular case, the commonly accepted wisdom is ... right! Eighteen months ago I told you "Philip Morris Stock Is Going Nowhere" -- and I was right. In fact, the stock has underperformed the broader S&P 500 index quite significantly since I penned that article. But times change, valuations change, and as amazed as I am to be saying this, it turns out that after a significant period of underperforming the rest of the stock market, Philip Morris stock now looks like a mighty fine bargain for stock investors -- and one likely to outperform its peers going forward. Why? First and foremost, Philip Morris stock looks like a good bargain today because it is cheap. Valued on GAAP earnings, a share of Philip Morris stock costs you only 17.9 times earnings today, while a share of former parent Altria (NYSE:MO) costs a steep 22.8 times earnings -- 27% more. Meanwhile, a pack of Lorillard (UNKNOWN:LO.DL) shares sells for 19.6 P/E -- cheaper than Altria, but a 10% premium to Philip Morris. What's truly amazing about Philip Morris's low P/E ratio, though, is the fact that the company is currently the most efficient profit generator of the three major tobacco firms. From the perspective of operating profit margins, Philip Morris boasts a 12-percentage point lead over both of its rivals. And on the bottom line, Philip Morris earns net profit margins -- pennies of pure profit per revenue dollar collected -- that put its domestic U.S. rivals to shame. Making so much money off of every revenue dollar, it's not surprising to learn that of the three tobacco majors, Philip Morris pays the best dividends. In fact, the 4.5% dividend yield that investors earn on a share of Philip Morris stock is nearly three-tenths of a percentage point better than what Altria pays, and a full half-percentage point better than Lorillard's payout. How does Philip Morris maintain such generous payouts? Simply put, because it's better at making money -- and so can afford to share more of that money with its shareholders. Lay these three firms side by side, and you can plainly see that Philip Morris generates far more real cash profit than do either of its rivals. 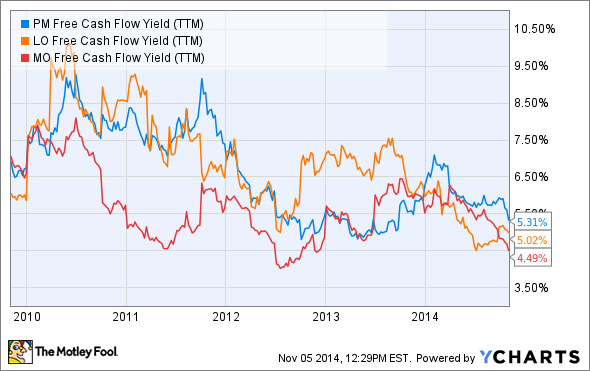 Its "free cash flow yield" is simply top of the heap. What do these numbers mean to you? Simply put, for every dollar you invest in a share of Philip Morris stock today, you can expect the firm to generate more than 5.4 cents worth of real, cash profits on your investment. That's three-tenths of a penny (or six percentage points) better than Lorillard can boast. And Philip Morris outclasses its former parent by an even wider margin, generating a free cash flow yield eight-tenths of a cent -- or 18% -- better than what Altria makes. All this extra cash is money that Philip Morris can use to pay you even bigger dividends in the future, to buy back shares (increasing the size of your stake in the company for every share it takes off the table), or to reinvest in its business and maintain its lead over rivals. While it's the advantage I've listed last, to my mind this cash-producing prowess is the No. 1 reason you can expect Philip Morris stock to outperform its rivals in the years to come.